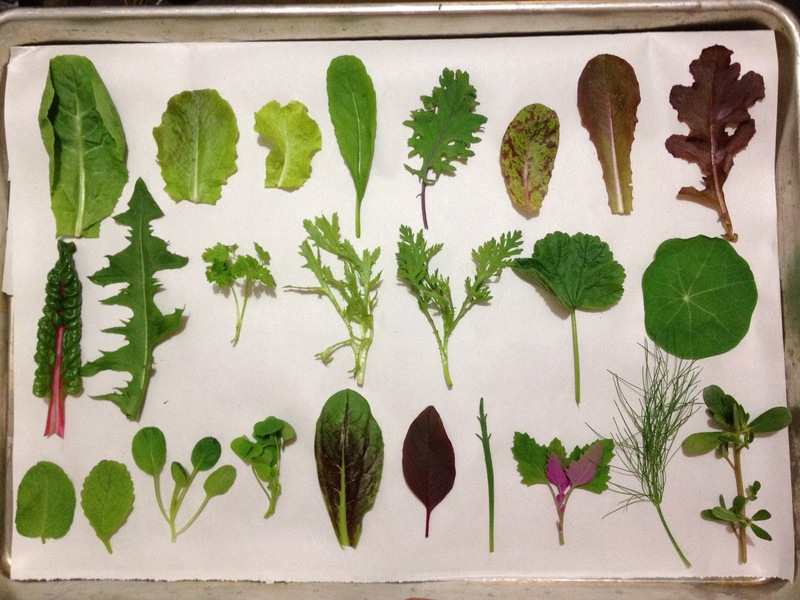 Enjoy this photograph taken by Sarah Golden of 25 different greens that are growing right now at Three Sisters Farm in the Bioshelter! Hmm, maybe some of these green are growing outside? Sarah recently spent two weeks volunteering at Three Sisters Farm. One evening when Darrell was mixing the greens to prepare them for sale, Sarah asked him how many different types of greens were in the mix. They decided to count. Darrell started handing leaves to Sarah and rattling off their names. The greens list is below the photo. Darrell Frey, author of Bioshelter Market Garden: A Permaculture Farm, built his bioshelter many years ago. He teaches the Permaculture Design Course at Phipps Conservatory and at his Farm with Elizabeth Lynch, Juliette Jones and others. He is truly one of the original permaculturists. 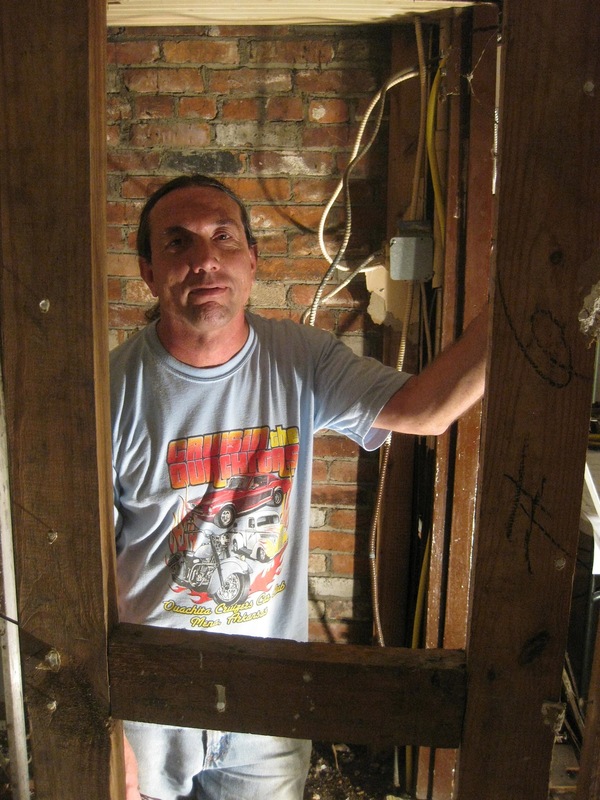 We are so honored that he and Liz are working with us on our project at 1317 East Carson Street! 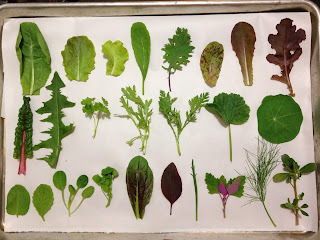 One day soon, when we open the space, we will sell delicious Three Sisters Farm Amazing Salad Mix! Stay tuned, and please follow this blog and LIKE us on the Schwartz Market Facebook page! Thanks so much Sarah Golden for sharing this photo with us! Well here they are, David and Frank, the folks that are doing the real physical work of the renovation. 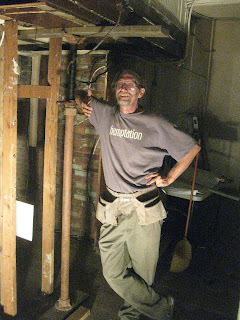 Below is David standing in the space that will become a handicapped accessible bathroom. We intend to keep the brick wall exposed, but geez, those wires need work! David is an amazing man and is bringing incredible healing energy with him every day. Our project is truly blessed to have him. This is Frank standing in the space that is to become the second bathroom. Frank is a master carpenter and painter, and we are thrilled he is working with us. Still lots of deconstruction needed here. The historical panopticon that is above this space will be stabilized this coming week and then the work will continue on the interior bathroom space. We have considered the idea of composting toilets, but for now we will be using toilets that use less water per flush. Our understanding is that the Living Building project in Frick Park may have gotten approval for composting toilets. Stay tuned, for when we know the details, we will pass them along to you so you can integrate all we know without re-inventing the wheel and starting from square one...If you are on Facebook, go to and join the new Facebook page called Living Building Challenge Collaborative --Pittsburgh to learn more about the Living Building Challenge and to see why we are so intrigued with it! We intend to open the market doors very soon. The focus for the next few weeks will be the bathroom renovation. We are practically down to the bones of the building in the area where the bathrooms are. Working within the context of the Living Building Challenge is a real eye opener. We are mindfully thinking about where each item that is deconstructed will go once it leaves the space. We are also in the process of figuring out where we will be sourcing materials and for that matter, everything that comes into the building. The process will be somewhat gradual so we don't go completely crazy! 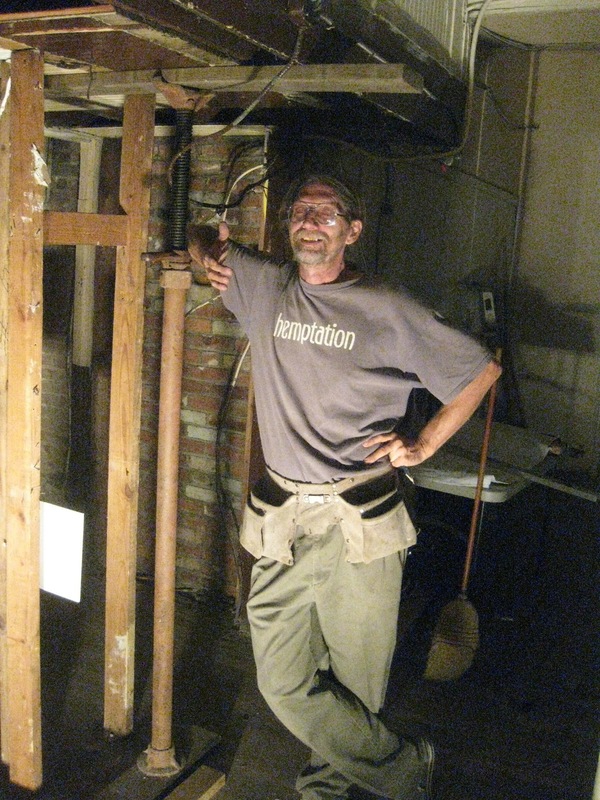 This is Darrell, Permaculture Designer, Author of Bioshelter Market Garden: A Permaculture Farm, and chief Contractor and Builder for the project at Schwartz Market. A genius in our midst. We are truly blessed with our entire energetic work force. 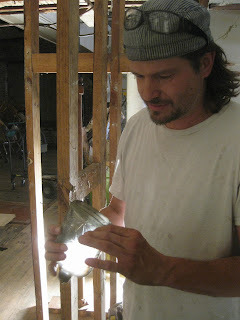 Here's David during bathroom deconstruction discovering and examining a bottle that was in the wall! He noticed the interesting sun design and was so excited! Frank examining the bottle too. Yup, it's a whiskey bottle! Several layers of flooring were deconstructed in the bathrooms. Frank and David found a penny dated around 1946 with the first layer of linoleum flooring. It's interesting to note that a new flooring product that is fine to use for the Living Building Challenge is called Marmoleum. Marmoleum is a natural, non-toxic product. The flooring layer found just above the linoleum was vinyl, a material that has a very toxic manufacturing process. A penny dated 1951 was found with that layer of flooring! Thanks workers that put that flooring down for letting us know when by placing pennies. 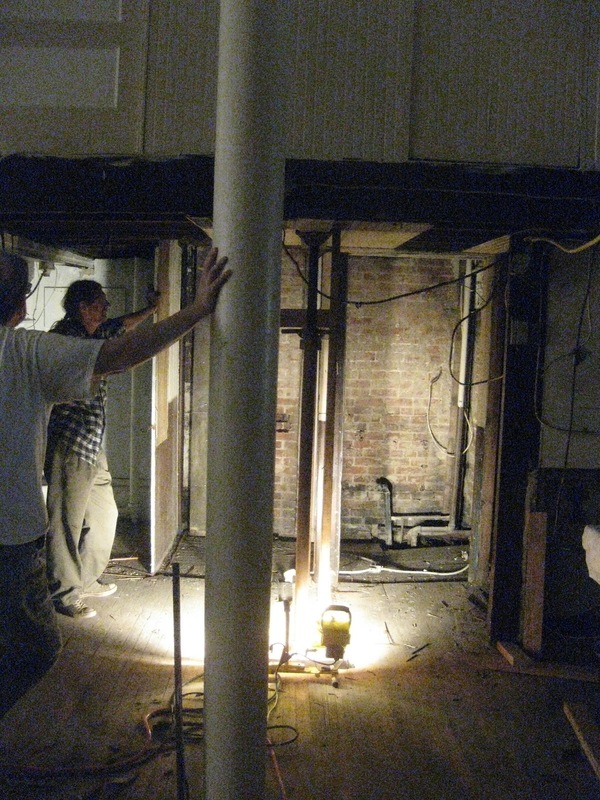 Darrell and Tony Albrecht, Architect, examining the space that will be two bathrooms in a few weeks!